Made in: Hollywood, California, U.S.A.
Other: Rotatable Lens, aircraft aluminum casing, Critical Re-Connect Technology, up to 30 Minutes of Pre-record, built in flashlight. 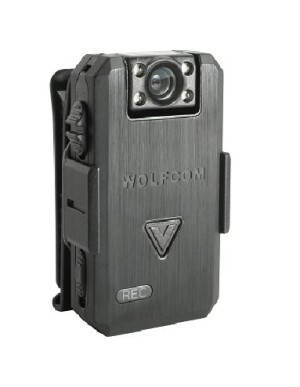 The WOLFCOM VISION is the model of what most police officers are requesting in a body camera today. The 2.2-ounce body camera features many key functions officers want at a fraction of the size, weight and cost. This body camera has a rotatable lens, allowing for maximum configurability and mounting options on the body for recording various angles. Officers with taller statures can rotate the lens down to record a better angle then the sky. The rotating lens also allows officers to wear the camera on their belts and point the lens up or on their epaulettes and point it down. Point Of View Options- The WOLFCOM VISION also accepts external cameras for POV cameras that can be mounted on glasses, epaulette, collar, pen pocket or other parts of the body. This is also the first body camera to use an optional two-camera system, with a patent pending technology called Critical Re-Connect, which means if the smaller POV camera is disconnected from the main camera in a fight or struggle, the main camera kicks in and resumes recording. With other manufacturer’s if the POV camera is disconnected, all video is lost. An optional night vision external camera has 8 infrared LED lights that can see in total darkness for up to 20 feet. The night vision camera has a button that must be pressed to activate the night vision. Double Retention Clip– The camera is also one of the smallest on the market, weighing only 2.2 ounces. The VISION comes with a 2.5″ rotatable alligator style clip, which has teeth to better grip onto a shirt or uniform. The clip also has a double bracket grip on the camera (called a double retention clip) for a more secure grip on the body camera. The body camera can also be secured using a lanyard as a backup in case the camera is ever pulled off of the uniform or out of its clip. This body camera is switch operated. Switches are recommended because an officer can always tell in an instant by looking and feeling if the camera is on or off by the switch position (with buttons it is always possible an officer can forget if they pushed the button). There are two other switches on the bottom of the unit that control the modes of the camera and can be used to put the camera in car mode or used to send video out. The camera only has two buttons, one for picture taking and one on the top for turning on the LED Flashlight. The body camera gives a strong vibration when turned on and off and when it starts and ends recording. This body camera has a 2.5-hour battery life on its own, but can be hooked up to an optional external battery pack for up to 15 hours of continuous record. It is switch operated, ensuring that an officer can always feel and see if the camera is on or off. Other functions– This body camera can also be used to take up to 56,000 still digital photos and record up to 360 hours of audio as a voice recorder. Modes can be selected by a switch. Still pictures can be taken even while video is rolling by pushing the “V” shaped button on the front of the body camera. The only exception is if the body camera is set to pre-record mode, then that button is used to start and stop recording. The body camera can also be used as a car camera and put into car mode so it will start and stop recording when the car is turned on and off. This body camera also has a video out mode, so it can be hooked up to an external monitor and play back video files. This body camera is made out of aircraft grade aluminum casing and has a 6-foot drop rating. It is nano-coated to be weather resistant. One officer testimonial says the body camera survived flying 15 feet out of his car window in a car crash. The top video quality is 1080p and has a 120-degree field of view (the maximum you can have before video becomes distorted with a “fish eye” look). This body camera does not have night vision built in, but it can be added as an optional external camera. This body camera has a built in flashlight (four LED lights) that come in handy at night freeing up an officers’ hands so they don’t have to hold a flashlight. This body camera also has an optional Public awareness light. Some departments believe public awareness lights de-escalate situations by letting the public know they’re being recorded. The light can also be programmed to blink or stay off entirely. The camera has a 30 Minute Pre-record capability. Most body cameras only have 30 to 60 seconds worth of pre-record. This function lets officers re-capture critical video if they are ever caught off guard and don’t have time to activate their cameras. The body camera itself does not contain internal GPS, but can be hooked up to a GPS module that will provide that function.